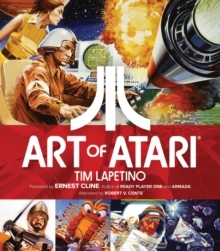 Now available with a signed tip-in sheet autographed by Tim Lapetino, author and Founder/Executive Director of the Museum of Video Game Art (MOVA)!Atari is one of the most recognized names in the world. Since its formation in 1972, the company pioneered hundreds of iconic titles including Asteroids, Centipede, and Missile Command. In addition to hundreds of games created for arcades, home video systems, and computers, original artwork was specially commissioned to enhance the Atari experience, further enticing children and adults to embrace and enjoy the new era of electronic entertainment. The Art of Atari is the first official collection of such artwork. Sourced from private collections worldwide, this book spans over 40 years of the company's unique illustrations used in packaging, advertisements, catalogs, and more. 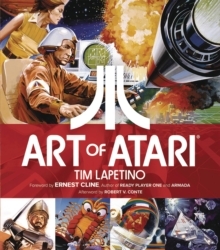 Written by Tim Lapetino, The Art of Atari includes behind-the-scenes details on how dozens of games featured within were conceived of, illustrated, approved (or rejected), and brought to life! Includes a special Foreword by New York Times bestseller Ernest Cline, author of Armada and Ready Player One. Whether you're a fan, collector, enthusiast, or new to the world of Atari, this book offers the most complete collection of Atari artwork ever produced! "For me, revisiting the beautiful artwork presented in this book is almost as good as taking a trip in Doc Brown's time machine back to that halcyon era at the dawn of the digital age.